Last Post showed my Bulova Golden Clipper and this time features my latest Lanco 1970 vertical Day-Date model from the Langendorf Watch Co. of Switzerland. Note the cherry red dial background with white/chrome batons and a clear and contrasting Day/Date window indication @6, chromed hour and minute hands with a center sweep seconds hand. There are luminous dot markers and infill to the main hands, but no longer active today. The surprisingly large and heavy solid Stainless Steel case is not perhaps the finest machining you’ll see, but the top surface is satin finished and the curved case sides are at least chamfered (the lower edges towards the integral solid steel bracelet are sharp edged). As said this case is large for the period at 42 mm x 36 mm x 12 mm and with the original integral stainless bracelet, which because of it’s fitting stands out a little proud from the case means the top to bottom dimension is more around 52 mm, so for the smaller wrist please note. Marked Anton Schild (AS) 2066 automatic with 46 hrs power reserve. Complete with the excellent and clearly marked AS 2066 (Anton Schild) 25 jewel mechanical Automatic movement which features a Crown quick set calendar for both Day and Date and a 46 hr power reserve, so no slouch in the quality stakes. 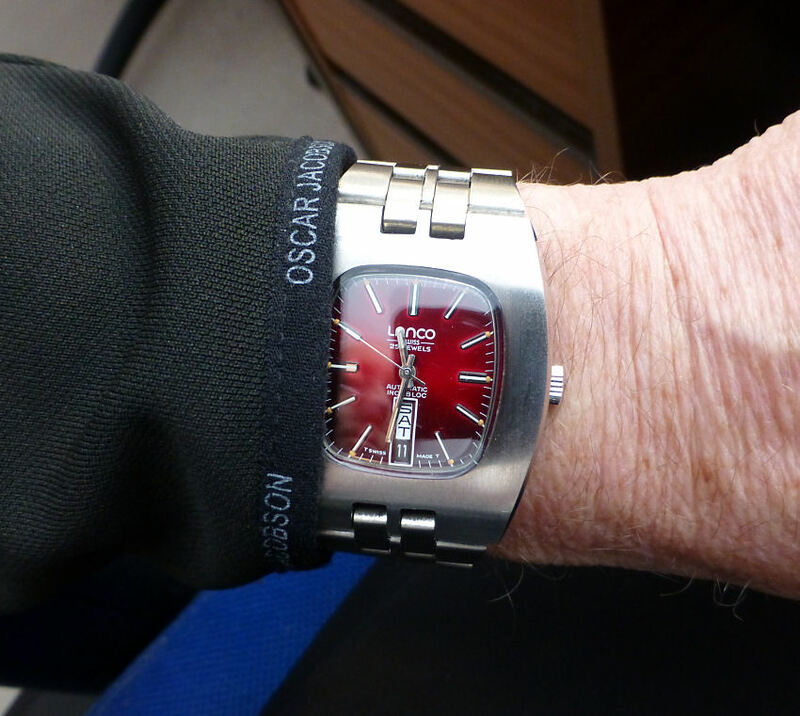 Wears quite big on the wrist, this Lanco, but looks great! I also note the bracelet comes with a removable 20 mm extension to the deployment feature, of a style I’ve not seen before and simply fitted with a small spring bar. 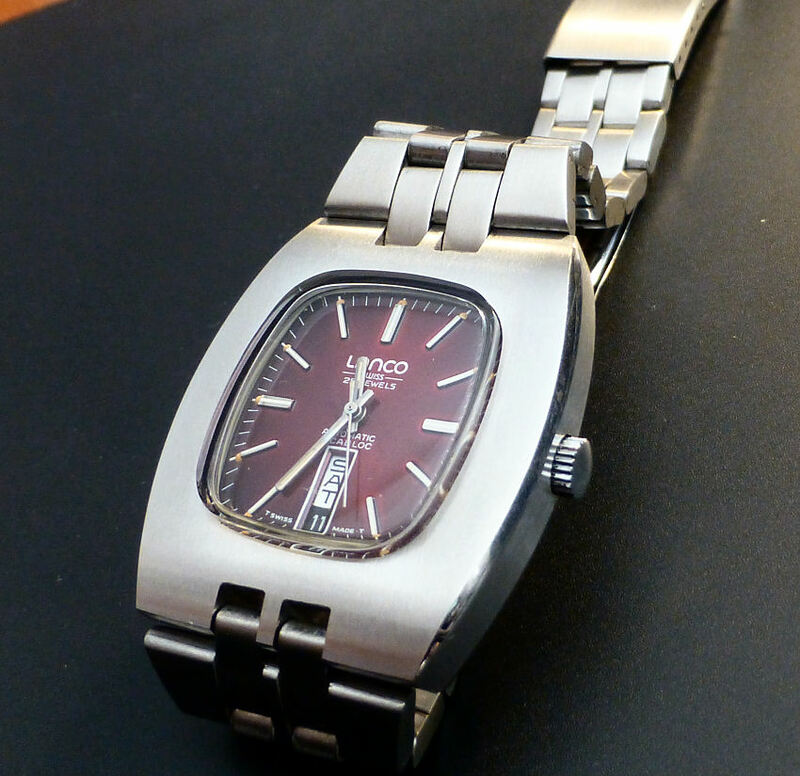 So two vertical Day/Date features 1970’s brands and yet so different as models. The Bulova from my last Post is a more refined watch overall with rounded elegant case fitting in comparison, though both look great on the wrist and of course both are starring in my new “odd features” box with the unusual vertical read Day and Date feature window @6, a style that can also be found in limited numbers from Rado, Hamilton, Enicar, Jules Jurgenson and even West End Watch Co.
As styles go this is a relatively rare find these days, especially in such good condition. With different Brands it’s also fascinating to see which movements are used, especially with the use of vertical set Day/Date wheels. Quite a number used quality AS movements and a nice compliment to what were often radically different 1970’s watch designs, and such a step change from the more traditional styles of the 1950/60’s. 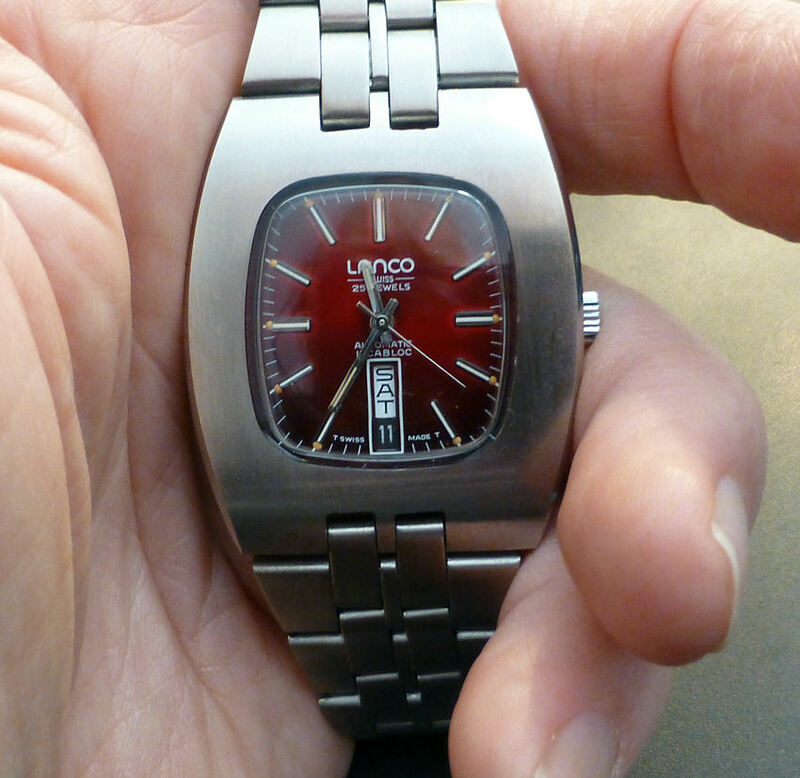 In the case of this particular Lanco Brand, the Langendorf Company who started in 1880 and known at one time as the largest clock manufactury in the world, progressing, if that’s the right word to the abbreviated Lanco company name from 1960, which in 1970/1 merged with the Omega/Tissot Group as a quality equal, though that said watch production under the Lanco brand finally ended just a few years later in 1973. So as an example of a Brand that won’t see the light of day again, perhaps ghosting through Omega/Tissot models today, may be one thing, but to have a Langendorf original does give me a little thrill. The collecting game – could this be a new phase? Isn’t it funny how your collection ideas can alter over the years. There was that time when you thought that Swatch was the thing, then all the variants of Timex or Casio then the true vintage models of 1920 – 1949, then the rectangular models, Day and Date models, Radio Controlled ones and so on and on . . . basically morphing as it goes along. And in my own case my stuff has always been a bit eclectic (even eccentric, some would say) and I tend to buy and collect mostly what I like, with little regard whether a “collectors” item or not – I basically don’t care about that aspect of watch collecting. Though I have to say that as my “proper” vintage watches go I have to admit over recent years refining these to more “collectible” ones, that I like, that is . . .
Needless to say this has begun to match other collectors ideas of what collectibles are all about, though I hasten to add, quite a few of the so called favorites are not represented (Rolex for example) – simply as I don’t like them very much, so why would I buy one. Odd that may be, but does show I’ve not completely joined the ranks of convention – well not quite yet. However, recently I’ve shifted towards more retro and in particular the wonderful 1970’s period. In this new collection my preference is for automatic mechanical models and often models that have a theme, such as dial shape or odd features. You have to remember that the 1970s was a pretty amazing time and one that I lived through – and I mean lived . . . so has a personal and evocative nostalgia. I suppose much of my love of the 70’s kick started just a few months before – in Bethel, New York on the 15th to the 18th August 1969 when I was long haired (oldish) hippy style with harmonica and guitar – and gone in the cloud (yes we had them in those days) with that fantastic experience – Woodstock! If you don’t know what that was, then look it up. But you had to be there – oh yeah – man . . . So in that crazy free and forward looking time, when lots of serious grown up problems were on us – not that we understood them anyway, because we had a Microwave! and crazy piled up hair (and this is the men) Peace man and Ban the Bomb, the end of the Vietnam War and the discovery of “Black holes” and the new wave riot of color – everywhere, and Discos and bean bags, space hoppers, and all in the face of rampant 30% inflation, Star Wars and even the Hostess trolley (came with that Microwave!) and all that – what also appeared was a wave of new style avant-garde watches, where the Swiss plus some others burst on to the scene with wonderful new designs and shapes in amazing styles – indeed creations of form that vibrantly portrayed the people freedom of the 1970’s perfectly. 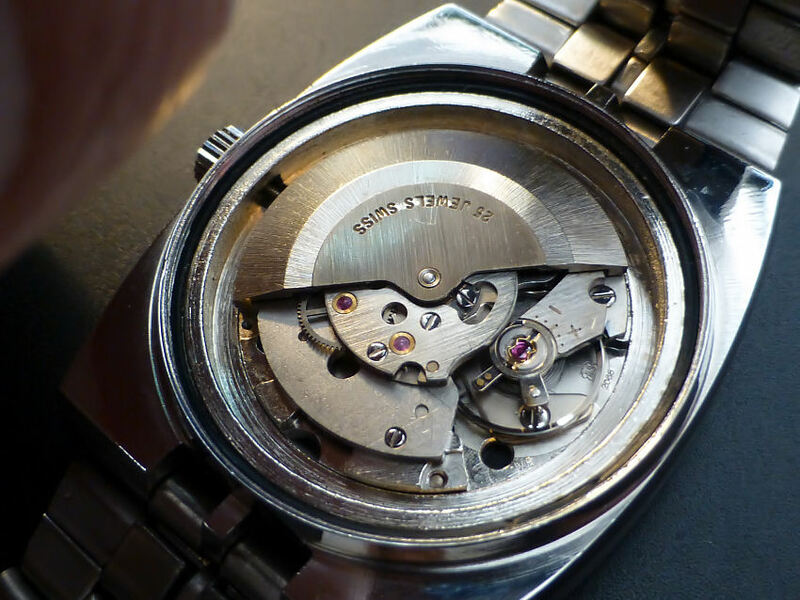 Squares, triangles, ovals, geometrics and goodness knows what, automatics, manual winds, Tuning Forks movements, new “jump” ideas and fantastic dial configurations, shapes, colors and so on – as I say a fascinating period. So it’s this era that’s got me not only interested (the phrase “light my fire” comes to mind) but actually excited once again and the great thing about 1968 – 1979 is that these great gone for ever models are still affordable. In twenty years these could be the true vintage models and my present vintage collection will be antique, or certainly more specialist perhaps and maybe, just maybe, dare I say – rather dull . . . . So this year it looks like I’m into the 70’s and already off to a flying start, such is the excitement of my collecting once again. In fact quite a few of my eclectic “modern” and vintage models might have to go to make room for my new ideas collection.